UNITED NATIONS, November 23 -- The UN last week dodged questions on topics from the Congo through Western Sahara and Liberia to Kosovo, from the funding of positions to the end of UN justice, using three separate spokespeople to do it. Inner City Press: the military head of MONUC for North Kivu Bipin Rawat has been quoted that the UN having to use white vehicles with “UN” painted on it has led to -- is one of the reasons that they have been unable to effectively combat with the forces of Nkunda. He said the camouflage and concealment are needed. Since he is a MONUC commander, what is the UNs response to one of its military commanders saying that he has the wrong equipment and it makes it impossible [to fulfill the UN's mandate] ? Deputy Spokesperson Okabe: I have not seen anything on MONUC on this. I’d have to look into it for you. Inner City Press: Ms. Wahlstrom's post, you said it's voluntarily funded. Who is paying for it? Deputy Spokesperson Okabe: We'll have to look into that for you. It's been reported that some Roma children died in Kosovo in camps that the United Nations built there, from lead poisoning. Do we know anything about that or to confirm, deny what happened? Deputy Spokesperson Okabe: I am not aware of any reports from the UN Mission on this subject, but we'll certainly check with them for you. While the UN now claims that the lead issues have not been raised since 2005, Germany's second-largest NGO is criticizing ongoing harm in 2007 and since. But no answer from the UN. On Tuesday, November 18, Associate Spokesman Farhan Haq was questioned by several correspondents about the UN's new $25 million ceiling in Geneva, a topic which would reappear on Thursday. Inner City Press: Somalia, then a couple of other things. On that, there are some trade organizations, including the International Chamber of Shipping, inter-tanker or inter-cargo -- they said that they’ve called; they’ve asked Ban Ki-moon to take action on the piracy issue. Has he received letters, other than from Member States on this issue, and has he responded to them? Deputy Spokesperson Okabe: I am not aware. Inner City Press: Alright. Also you said this thing on Gaza -- Tzipi Livni has said that Israel will now boycott the Durban II Conference in April in Geneva. Is the UN aware of that? Do they have any… Do they see any linkage between the calls by Ban and the Human Rights Commissioner yesterday [and] this announcement? Deputy Spokesperson Okabe: The Office of the High Commissioner for Human Rights regrets Israel’s confirmation that they do not intend to participate in the Durban Review Conference. Given the critical importance of the issues under discussion at the Conference, broad participation is essential. These issues of racism, racial discrimination, xenophobia and related intolerance are issues which affect all countries and millions of individuals around the world, on a daily basis. The outcome document of the original Durban Conference was agreed to by consensus and is an extremely valuable document with important and innovative recommendations for tackling racism in all its manifestations. This is the initial response from the Office of the High Commissioner for Human Rights. Inner City Press: I actually want to ask, on this, what they call the internal justice system, there is a report -- ACABQ came out with a report fairly critical of the Secretary-General for not having this system ready for January 1. It was supposed to be ready. One, what’s the reason for the delay? And two, what’s the Secretary-General going to do to make sure that some internal justice system remains in place (inaudible) on December 31? Deputy Spokesperson Okabe: Well, it’s obviously a high priority for the Secretary-General. I will look into the question that you have, because I don’t have anything further on it now. Inner City Press: Michele, a question has come up today at the stakeout, which is, what’s the process for appointing a new Special Representative or Envoy to Western Sahara? It’s been a number of months. Who is performing the job, and is it getting any closer to actually naming one? What’s the hold-up? Spokesperson Montas: Well, I am hoping that we’re getting closer to that point. From what I gather, there is enough agreement among the parties for the Secretary-General to announce an appointment. But I will let you know as soon as it is confirmed. Inner City Press: I wanted to ask, were you in Geneva with the Secretary-General? Spokesperson Montas: No, I was not. Inner City Press: Okay. I guess, maybe it’s the last time I’ll ask this. But the controversy about the ceiling that he inaugurated, there was a lot of press coverage. 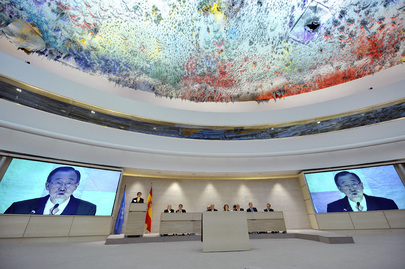 So, I’m just wondering if, now that he has seen how it was covered, was there some, and the Spanish Government has said that its international cooperation budget was used for this $25 million ceiling in Geneva. Was there any response from the UN about whether, maybe the project started before the financial crisis, maybe it would have been done differently, but thus far there has been no statement at all despite many questions and many articles. What’s the thinking about…? Spokesperson Montas: Well, the project was under way before any financial crisis. And as far as I can understand -- and you should probably ask the question to the Government of Spain -- they have a budget that treats not only cooperation matters and assistance to a number of countries, but in the same budget, they also have UN affairs. And it is a decision by the Spanish Government to use some of that money from that fund to sponsor the work of art that is that ceiling. Inner City Press: Forgive me (inaudible),… then I promise this is the last one on this. Does the Secretary-General, is it your sense that he’d feel, given the financial crisis now, that if a Government has a mixed budget like that, that it may be important to deal with the needs of the poor or Millennium Development Goals first and $25 million ceilings later? Spokesperson Montas: In the case of a gift from any Government, it is matter for the Government itself to decide. Inner City Press: The spokesman for the CNDP in the Congo has said that they pulled out of the town of Kinyandoni, but that the FDLR has, in fact, moved in. That they’d asked MONUC to, if they were going to pull back consistent with the ceasefire, that MONUC should patrol the area rather than letting these other militias in. Did the UN move in, or is it aware that the FDLR rebels have, in fact, occupied the lands that the CNDP has pulled back from? Spokesperson Montas: You can get that information from our colleagues in DPKO. Spokesperson Montas: It has to confirm the information. Inner City Press: I guess the main thing I’d say is, is MONUC endeavouring, since the UN is encouraging CNDP to pull back from Goma, does the UN then take control of those areas so that other militias...? Spokesperson Montas: That’s what I am saying. For what is happening in the field, you’re best to call DPKO and try to find out. They will get for you the exact situation on the ground in that specific area which I don’t have myself. Inner City Press: Right, right. I mean, I guess, could somebody... it’s like the Congo policy issue. So, you may say the same to this, but in Liberia, the press union of Liberia has said that UNMIL peacekeepers were involved in the seizing of a camera from a journalist at the request of the Chief Justice of the country. So, I guess, although you may say I ask Liberia, I want to know, does UNMIL, does it have a sort of a press freedom component? Or would you be surprised that that took place; and if it took place, why it took place? Spokesperson Montas: Well, let me check first whether it took place and what happened exactly. As soon as I get the circumstances, then I’ll let you know. Inner City Press: Okay. I’m just wondering, there is no place else I can ask this one, so I’ll ask it here. It has to do with the internal justice system of the UN. I notice that this evening the Secretary-General is going to this, I guess it’s the ending of the Administrative Tribunal. But there is nothing to take its place. It’s been said by ACABQ and others that the new system of justice that was supposed to begin 1 January is not going to begin. So I think I asked earlier in the week but there are a lot of countries that I asked yesterday, what is the plan for 2 January for, you know, staff members or whatever, you know, for people to be able to (inaudible) claims for the UN to consider? Spokesperson Montas: For the time being it’s still being discussed, as you know, within the Budget Committee, about the money aspect of the whole set up. Why don’t we let this discussion take its course? And then we’ll find out, first, whether they will be able to start as planned in January. And then, of course, I will let you know what is being put in place in case it’s not ready.